If you are missing one or more teeth with roots, implants should be your first choice. There is nothing better than strong teeth, neither aesthetically nor functionally. 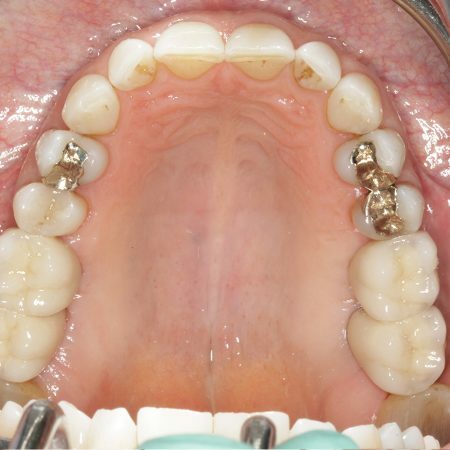 Implants are artificial dental roots that are anchored in the jawbone like dowels in the wall. Tooth gaps can thus be closed without damaging adjacent teeth by grinding down. People with removable dentures can benefit too from this method. Implants can enormously increase the fitting of dentures. In some cases the molesting palate plate can be removed. Patients will enjoy long forgotten pleasures of taste and thus have more quality of life. 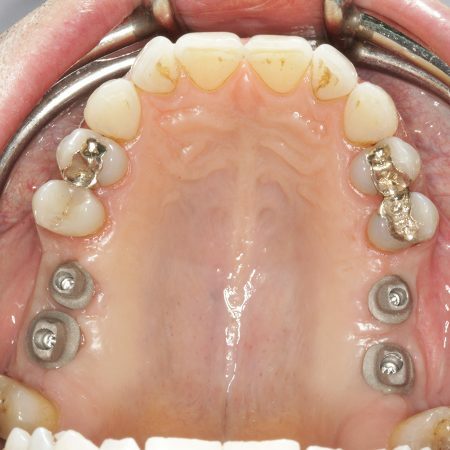 In this case 4 dental implants prevent a removable denture. How long an implant stays anchored in the jaw and how successfully the healing proceeds, depends on many individual factors. But it is certain that implants are as long lasting as natural teeth provided that thorough dental care and regular professional teeth cleaning are observed. Thus peri-implantitis, an inflammation of the implant, which may lead to the loss of the implant, can also be prevented. Currently you have to reckon that the healing phase in the lower jaw will be two and in the upper jaw four months. Then the new tooth is fully functional. The healing phase in the lower jaw is shorter as the bone is much stronger. Whether a bone augmentation is necessary cannot be generally answered, as there are too many individual factors. Fact is, that when teeth have been lost years ago, a bone augmentation is likely to have been done, as the jawbone has meanwhile reduced enormously. Therefore we try to implant as early as possible after tooth extraction. The implant takes over the function of the tooth-root and transfers the masticatory force to the jawbone. In some cases an implant can be placed immediately after tooth extraction. Arrange an appointment: We would be pleased to advise you individually and give further details. Continuous training is an essential component of quality control. Therefore Dr. Ganß is member of the largest German Implantology Society .